These days, everybody knows the importance of a healthy diet. As well as making you feel better, what you eat can also affect the condition of your skin, your nails and your eyes. But did you know that it can also affect your hair? Many common hair problems can in fact be traced back to poor diet, and your hair can serve as an early warning system when more serious things are going wrong. What makes hair healthy? To develop the right diet for healthy hair, it's necessary to consider two things - the hair itself, and the scalp it emerges from. Hairs are made out of keratin, a form of protein. In order to make keratin, your body needs a diet which is sufficiently high in protein. This is why people suffering from prolonged malnutrition tend to have brittle, fragile hair. Most people get the protein they need from meat, fish, eggs and dairy produce. Good vegetarian protein sources are nuts, beans and seeds - a well balanced vegetarian diet should not leave you requiring supplements, but new vegetarians sometimes have problems. A healthy scalp requires a good source of fatty acids from which to produce lubricating oils. These give your hair its flexibility and its shine. Fish, walnuts, olives (and olive oil) and beans are excellent sources of healthy fats and won't make you put on weight. The next most important aspect of diet for healthy hair is water. Most people don't drink nearly enough. Aim to have at least two litres a day if you want to keep your hair at its best. One of the most common times for hair problems to occur in relation to diet is when people are trying to lose weight. This is because a weight loss diet - especially one that doesn't follow professional guidelines - may mean you don't get enough of the nutrients your hair needs. In order to keep your hair healthy when dieting, you should aim to eat low calorie foods with high quantities of important nutrients. Carrots, beans, leafy green vegetables, onions, grapefruit, strawberries and nuts are excellent sources of essential vitamins and minerals, and relatively small portions, eaten regularly, can make all the difference. If you are on the Atkins diet, plenty of fish and liver will help to protect your hair. Eggs are fantastic, containing almost all you need. Dieting and illness commonly lead to deficiencies of iron (especially in women) and zinc. Seafoods are rich in both these elements and beans are the best option for vegetarians. If you suspect you have an iron deficiency, it's best to discuss it with your doctor before taking a supplement, but modifying your diet is a safe alternative. Generally foods that are bad for your hair are bad for the rest of your body too, so there are plenty of reasons to avoid them. Salt and saturated fats are top of the list. Most people consume too much of these substances because they're present in so much processed food that they can be hard to avoid, but cutting down will not only be good for your health, it'll make your hair stronger and shinier in a very short space of time. Although fish is generally very good for your hair, certain types of predatory fish - tuna, swordfish, shark and anchovies - should be eaten only in limited amounts. This is because they tend to contain high levels of mercury which are bad for your scalp and can weaken your hair. Finally, you probably already know that smoking can damage your hair, but did you know that some vegetables can too, for the same reason? 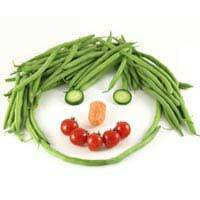 Tomatoes and aubergines are natural sources of nicotine which binds up the vitamin C your hair needs to stay healthy. They're fine in moderation but large amounts can leave you with dull, unhappy hair.